On Monday, the US and South Korea started military drills amid North Korea's recent ballistic missile tests. Pyongyang authorities asserted that military exercises only fuel North Korea's intention to develop preemptive nuclear strike capabilities. In an interview with Sputnik, an expert from the Shanghai University of Foreign Trade, Zhan Debin, confirmed that the current military exercises are aimed at deterring North Korea's nuclear activities. "Joint exercises of the United States and South Korea are a deterrent measure against the DPRK. North Korea has successfully launched ballistic missiles, developed nuclear technologies. So it is quite obvious that the sanctions introduced by the United States and the United Nations can't contain it," the expert told Sputnik Chinese. 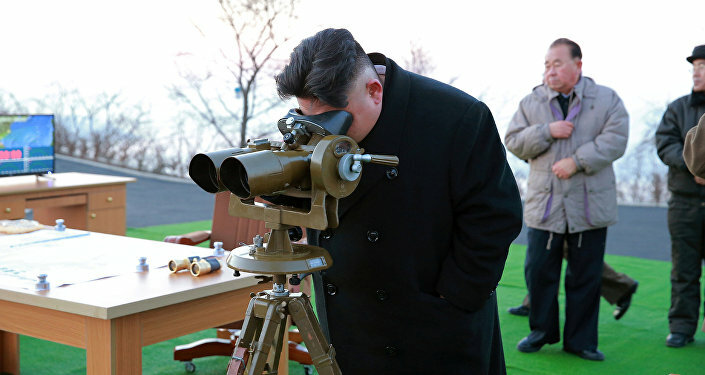 Pyongyang has repeatedly carried out missile tests, raising serious concerns in the international community. On March 6, North Korea launched four ballistic missiles, explaining a day later that the launches were a test of its ability to strike US military facilities located in Japan. Last year, North Korea carried out two nuclear tests and over two dozen test launches using ballistic missile technology. Previously, the United Nations imposed sanctions on North Korea for three nuclear tests it carried out in 2006, 2009 and 2013. According to Debin, during their military exercises, the United States and South Korea were practicing the operation of "physical liquidation" of the North Korean leader, as well as various scenarios of the destruction of nuclear facilities. "Thus, they want to show Kim Jong Un that if the sanctions do not have any effect, they will resort to last-ditch measures to curb the nuclear ambitions of the DPRK. Their logic remained unchanged: if the nuclear program is underway, North Korea's regime will ultimately be destroyed. The exercises are designed to serve as a very serious warning in military and psychological terms," the expert told Sputnik. Debin stressed that in this way the US and South Korea want to intimidate North Korea's leader personally. However, on the other hand, the military drills can encourage the DPRK to enhance the development of its nuclear technologies even further. In Debin's opinion, a military strike against North Korea would be a bad choice in the current situation, as no one can predict Pyongyang's reaction. "Under these circumstances, China should continue efforts to resolve the North Korean nuclear issue through negotiations as military methods won't solve the problem. The escalation of military tensions is beneficial neither for the Korean Peninsula, nor for the region as a whole," the expert concluded.